Champion is opening its fifth U.S. store in Philadelphia on March 23 in Center City. 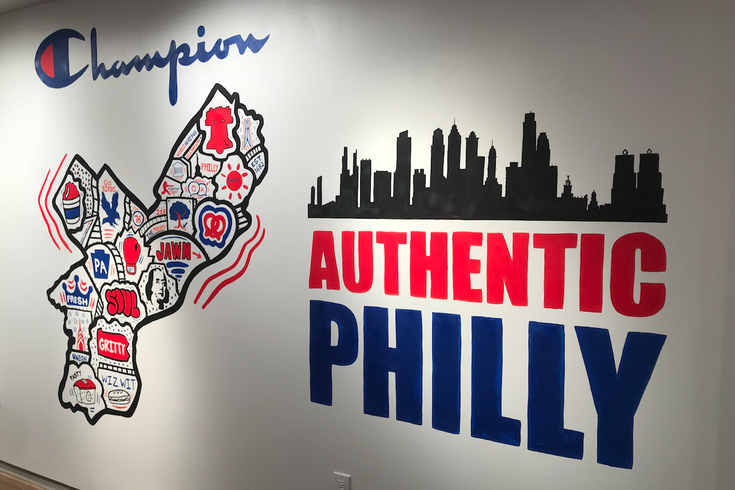 Champion has announced that the first 500 customers to visit their Center City store on Saturday will receive a tote bag designed by local artist Alloyius McIlwaine. Champion opened its fifth U.S. store in Center City in the space that was formally occupied by Diesel. In honor of its opening on Saturday, March 23, the store has set up two installations by local Philly artists, Mcilwaine and Ishknits, who are both a part of the artistic collective known as Tiny Room for Elephants. Mcilwaine, who grew up in North Philly, has created murals all over the city, from Dave and Buster’s dockside mural to Raven Lounge in Rittenhouse. His biggest mural to date, at 67 feet by 50 feet, is at the intersection of 2nd and Washington Ave. in South Philly. He's also created murals all across the United States, including New Orleans, Miami, Portland, and Los Angeles. He's even created a slew of international murals in Morocco, France, Costa Rica, and Canada. Ishknits is known for her work crocheting and knitting street art projects, otherwise known as "yarnbombing." Currently celebrating their 100th year in business, Champion has opened stores in New York, Los Angles, Chicago, and Boston this year. The Center City location is the first two-floor Champion store in the U.S. Along with installations from local artists, there is an installation of vintage Philly sports gear. The store also features on-site embroidery and the ability to customize your Champion looks. Champion is located at 1507 Walnut St. in Center City.